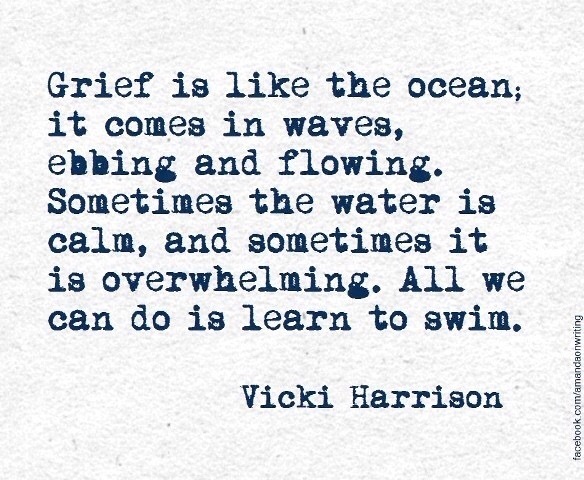 Grief is like the ocean; it comes in waves,ebbing and flowing. Sometimes the water is calm, and sometimes it is overwhelming. All we can do is learn how to swim. When we are going through a time of grief, it’s easy to get lost in the sadness. I know this, because like many of you, I have had to face a moment of grieving a time or two from the loss of a loved one. Most recently, a very close person in my family passed away, and it was very unexpected and troubling for my family to deal with. How could this happen? What if I had done something different? Did I tell them how much they meant to me? Is there a way it wouldn’t have ended up this way? How am I going to move forward? These are the heartbreaking questions we ask ourselves when we say goodbye to someone we love and care about. This is probably the most difficult part. If you’re like my family and I, this is usually the part where Faith comes in, because it’s a natural coping step we take. Whether you are Catholic like we are, or have the faith in any higher power, this is often the source of peace many of us turn to in this time of need. The reason I think Faith is so important in these situations and times when we’re grieving, is because many of us feel like we have to face the sadness alone. And that’s the thing, you don’t. Even aside of Faith, holding the burden on your shoulders and not allowing someone to help lift it off of you, can be difficult and even make that situation harder to deal with. In the moments where we are confused or hurting, it’s okay to let others in. Grief is a very natural part of life, so it’s only normal that we need to take a step back, take the time that we need and be vulnerable if necessary in order to heal. I’m sorry that you’re going through a difficult time right now, and want you to know my heart and warm thoughts are with you.